Notice anything odd about this picture? Like how I’m wearing shorts and a t-shirt, and all the camera crew guys are wearing jackets, gloves and hats? That’s because it was 29 degrees when we started working. Towards the end of the shoot — a series of promotional spots for a local TV station — it warmed up to around 55, but the wind was still pretty cold. One of the production assistants was in charge of blankets for the cast, and another was in charge of taking everybody’s jacket and running on set in between sets to hand them out. At least I was wearing knee-length shorts and a t-shirt. Some of the girls were in sleeveless tops and little shorts. 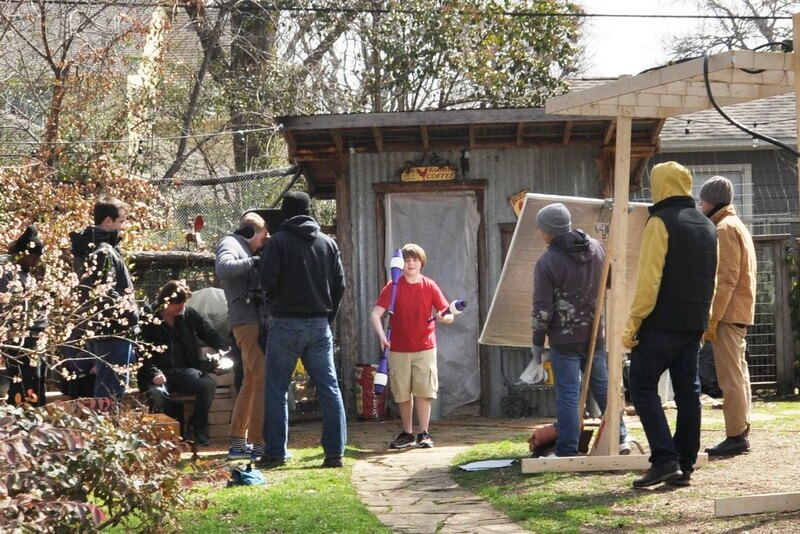 Even though we were cold, everyone on the set was very nice, and we had a lot of fun. 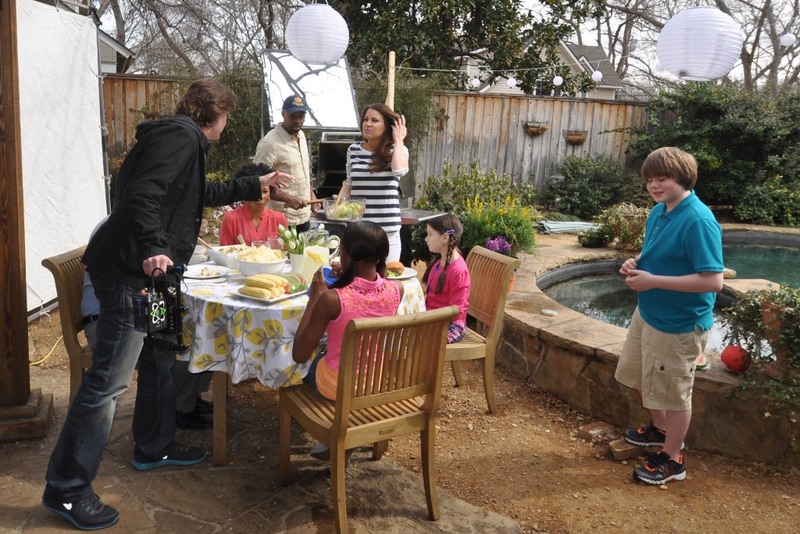 For one of the scenes, we were supposed to be at a summer cookout, and I got the task of eating watermelon. Lots and lots of watermelon. One of the prop guys poured sugar on it for me because it’s not really in season right now and it was pretty sour. Filming was delayed for a few minutes while we waited for the sun to come out from behind some clouds because everyone’s breath was showing up on the film. So we huddled under our blankets and waited for a few minutes until the cloud moved, and that helped a lot. We were filming at a house near White Rock Lake in Dallas, and they had a really pretty backyard pool. But I was really glad nobody even mentioned going in the pool. A couple of years ago, I filmed an industrial for the American Heart Association on heat stroke danger, and we spent half of a December day in a heated pool. It was a lot warmer that day than it was for this shoot — at least 20 degrees warmer than it was at the end of this shoot — but that was still pretty cold. They rubbed thick skin cream on our skin for that one so nobody’s goosebumps showed. But I’d rather be out in the cold filming than inside, being warm, and not working. It was a really fun shoot, and I know I am very lucky to have a great agent who helps me get jobs like this one. Thanks, Linda McAlister Talent! ← No School Today: But I Booked Three Jobs! Gee, thanks! I saw some photos of you wearing shorts in the snow, so maybe you don’t get as cold as I do. I will pass on a swim until it warms up. But that will be pretty soon. You can swim here 8 or 9 months of the year usually. It’s pretty late in the spring for it to be this cold. Thanks for visiting the blog and leaving a comment. I really like your pictures of New Zealand. I want to visit there someday.